Frequent business travelers who want to earn rewards without a high annual fee. With flexible redemption options, 2X miles on every purchase and a solid intro bonus, this card is perfect for someone who travels often for business but does not want a card with a high annual fee. This card is easily among the best business credit cards of 2019. 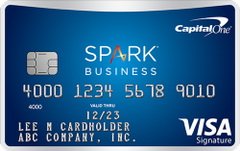 Our take: The Capital One Spark Miles for Business card offers a valuable travel rewards program, but is too similar to the more flexible cash back version of the card.